Home » Science Notes Posts » Biochemistry » Food Chemistry » Why Does Cilantro Taste Like Soap? Some people think cilantro and coriander taste like soap. If you crave tacos al carbon with onions and cilantro or are a big fan of chutney or falafal, you likely appreciate the tangy citrus flavor of cilantro. However, a significant number of people think cilantro tastes like soap. Whether you like cilantro or loathe it depends on genetics and to some extent your experiences with food growing up. Cilantro appears virtually indistinguishable from flat-leaf parsley — for good reason. Cilantro or Chinese parsley is the leafy portion of the coriander plant (Coriandrum sativum), which is an annual herb in the family Alpiaceae. The same family also contains parsley, celery, and carrots. Basically, cilantro and parsley are kissing cousins in the plant kingdom. Cilantro and parsley may look similar, but cilantro has a pungent fragrance, while parsley simply smells green and fresh. Parsley has such a delicate flavor that some people only consider it a garnish, while cilantro has a strong flavor. Another plant, called culantro or Mexican coriander, belongs to the same family and tastes even stronger than cilantro. Most people think cilantro smells earthy/spicy and tastes like tart lemon or lime. However, between 4% and 14% of tasters liken the flavor to that of bath soap or rotting produce. The aroma and flavor come from the mixture of polyphenols and terpenes in the leaves. One of these compounds is linalool, a terpene alcohol found in citrus fruits and also cinnamon. To a certain extent, food preferences depend on a person’s familiarity and experience. Within ethnic groups that feature cilantro in traditional cuisine, 7% of South Asians, 4% of Hispanics, and 3% of Middle Eastern taste-testers indicated a dislike for cilantro. However, there is a strong genetic component to the flavor of cilantro. Expanding the study based entirely on genetic data: 21% of East Asians, 17% of Caucasians, and 14% of persons of African descent disliked coriander and cilantro. In studies of twins, 80% of identical twins and 50% of fraternal twins agreed on a preference for the herb. 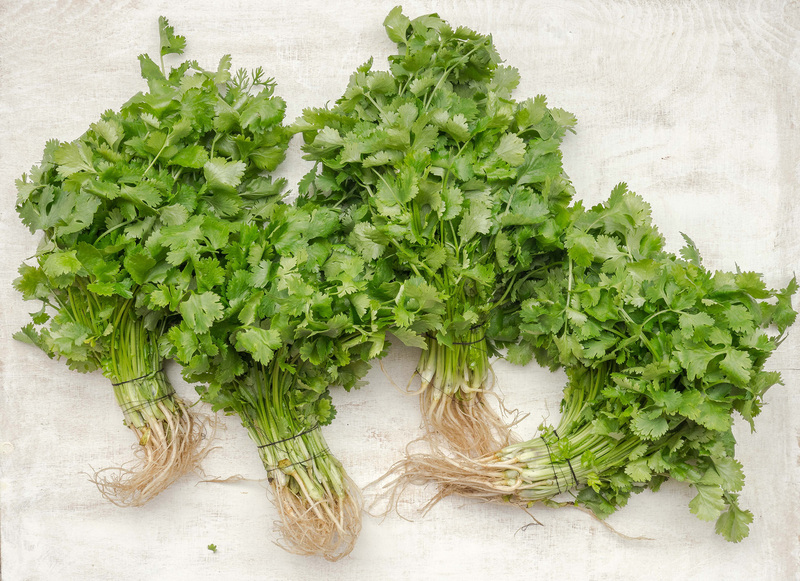 Further research finds two genes linked to the perception of cilantro flavor. Both are associated with the sense of smell. Gene OR6A2 makes a person highly sensitive to the odor of aldehydes. Persons with this gene may be offended by the mixture of aldehydes in cilantro and also unable to detect the citrus scent other people find pleasant. The other gene encodes a receptor for bitter scents and flavors. 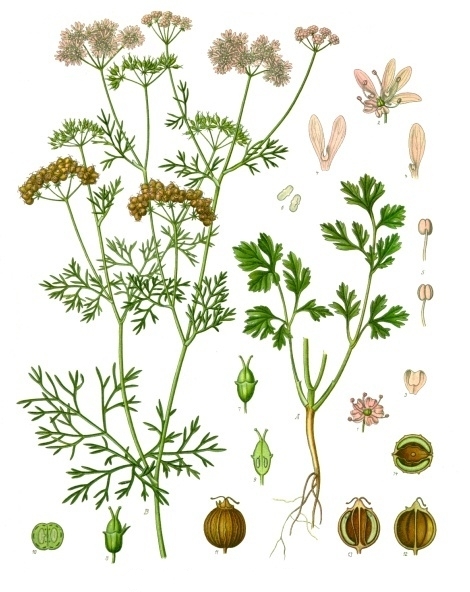 If this gene is active, the bitter taste of cilantro may dominate its flavor. Some people may avoid cilantro and coriander seeds because of allergies. One study using pin-prick tests found 32% of children and 23% of adults tested positive for an allergy to cilantro, caraway, celery, and fennel. In some cases, the allergy might only be mild, but there are cases of life-threatening reactions to the herbs.